When the fall semester comes to a close, the five sororities of the Panhellenic Association will secede from the Interfraternity Council. Wang said that Panhel has recently become more focused, and is ready to exist as its own entity. “In the past year or so, Panhel has seen quite a resurgence,” said Kathleen Baxter, program coordinator for fraternities, sororities, and independent living groups. Many of the issues that the IFC addresses do not affect the sororities as much as the fraternities and independent living groups. Aside from the differences in rush, the IFC, for example, often discusses risk management, but MIT’s sororities are dry by mandate from their national chapters. Thus, sororities direct their efforts towards better programming and development, particularly regarding health and wellness, Baxter said. In recent Panhel meetings, five objectives have been established for member development, including scholarship, service, social programs, health and wellness, and public relations. Wang feels that having these five goals has made the group a stronger and more focused group, but that the IFC does not address them as the sororities would like. Because Panhellenic rush will no longer coincide with IFC rush in 2002, “it is important for us to have our own governing body that focuses on recruitment of women for the spring,” said Alpha Phi President Julia Chen ’02. In order to prepare for the coming changes, Panhel will also be devoting attention to the development of Junior Panhel and the promotion of the Panhellenic name. Although Panhel members will no longer be members of the IFC, Wang believes that relations between the IFC and Panhel members will continue to remain strong. “For us to be successful, we need to work closely with the IFC and [Living Group Council],” Wang said. The IFC is currently establishing the framework for next year’s Greek Week in order to promote the FSILG system. A Panhel member and an IFC member will organize the event. Chen said that the lack of a bi-weekly meeting with presidents from all FSILGs will cause some initial difficulties, but Panhel’s future strength will further help their relationships. IFC President Rory P. Pheiffer ’02 said that “the IFC will continue to address the needs of their members.” However, Pheiffer added that their exact focus of Inter-FSILG relations and External Relations will be for the next Executive Committee to decide. 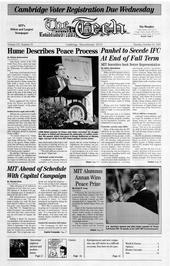 The two groups merged when sororities first joined the MIT campus. However, “it was only a matter of time before the Panhel organization became a strong enough organization to stand on its own,” Pheiffer said.